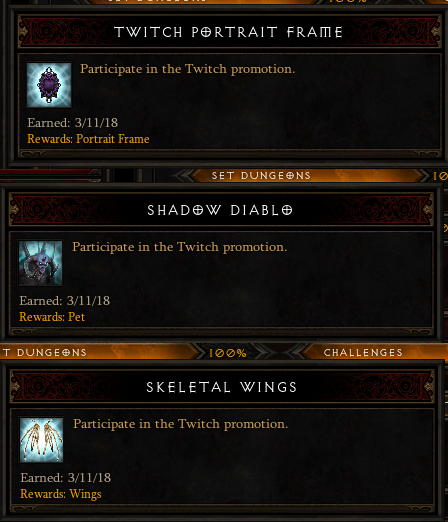 It seems that Twitch Prime members will receive a Portrait frame, Skeletal Wings, and a Shadow Diablo pet in an upcoming Twitch promotion. Redditor Kenaya came across a player with unique achievements and all the goodies listed above. He posted some interesting screenshots on Reddit. The player had three achievements related to a Twitch promotion that hasn't been officially confirmed yet. Any content is good content I suppose, but all this will do is make people log in for 5 minutes to claim their rewards and then log off until next season. Dungeon crawlers, like Diablo, Champions of Norrath, Baldur’s Gate etc, seem to be getting absolutely no love in the west. I truly enjoyed the year or so I spent with D3 playing online and doing 4-5 seasons. However the game ran its course with me and it seems the genre has run its course with western gamers. However the game ran its course with me and it seems the genre has run its course with western gamers. From my point of view, it seems like people are really looking forward to a worthy hack & slash game. The new season is finally live on the PTR! We'll be taking a look at all the new features so we can all be prepared for mid-May when the live patch is scheduled to arrive. Our very own Stan will be diving into the PTR and sharing all the details for those of us that don't want to spoil ourselves on the massively increased legendary drop rate test realm, or for those that don't have time/just want to wait for the real thing. With Patch 2.6.4, we started a new process for testing content both internally and externally that worked well for our production schedule and helped ensure that we received focused, actionable player feedback. We’re going to continue using this process for Patch 2.6.5, with a one-week PTR to fully test Season 17. On the docket are also highly-requested quality of life changes, item changes that should boost some fan-favorite playstyles, and an all-new Season 17 buff that'll help us bring the te﻿rror to the Season of Nightmares! PTR Details PTR Goals PTR Tips Patch Notes General Quality of Life Seasons Items Bug Fixes How to Participate in PTR PTR Character Copy Please note that this is a preview for PTR content, which is subject to change. We'll be conducting the Patch 2.6.5 PTR over the course of one week, starting Friday, April 5. During the course of the PTR, there may be periodic maintenances, outages, hotfixes, or minor patches. There will be two buffs active to help you on your PTR journey: increased Legendary drop rate and double Blood Shard drops. This should allow everyone to acquire any class set items (or supplemental items) that they might need! Feedback should be provided in the PTR Feedback forum while bug reports should be provided in the PTR Bug Report forum. Clearly separating these tracks allows our designers and quality assurance testers to hone in on the information they need most. With another new game-impacting Seasonal buff and several beefy boosts to Legendary items, we know it will be very tempting to get your hands dirty with as much as you can! To help guide your focus, here are the priorities in terms of what we’d most like to see tested. As with our previous 2.6.4 PTR, this testing period will have a short duration. Whether you’re a PTR veteran or newcomer, we thought we’d pass along a few tips to get you started. Last updated March 29 @ 10:00 p.m. PST. Below you will find the patch notes for the most recent update for Diablo III, Patch 2.6.5. General Quality of Life Seasons Items Bug Fixes Note: All changes apply to all versions of Diablo III, including PS4, Xbox One, Switch, and PC unless otherwise indicated. Additional stash space has been added for all players PC: 5 additional stash tabs are now available PS4/XB1/Switch: 140 additional stash spaces are now available Search functionality has been added to Stash (PC Only) All Crafters now have an Expand/Collapse All button for recipes (PC Only) Most Bounty indicators are now displayed immediately after entering the Bounty area Death's Breath now drop in Horadric Caches Developer Comment: With 2.6.5, we’re aiming to address some of the longest standing and most desired quality of life features the community has brought to us. We’ve hit a little bit of everything, from adding additional Torment levels, making Ancient/Primal Puzzle Rings feel rewarding, and rehauling stash space in both size and functionality. Other changes were made to help smooth out overall gameplay, such as making Bounties feel less of a chore and more rewarding and reworking a few of our notification screens. The Season Journey Journal now displays all chapters, regardless of current progression Added the buff for Season 17 Player’s damage dealt is increased by 750% and damage taken is reduced by 4% for every Ancient Item they have equipped while having no Set Bonuses Active Developer’s Comment: The Season of Grandeur was by far our most popular Themed Season yet. In the wake of having a free Ring of Royal Grandeur active, we saw a lot of requests to try the same thing with the Legacy of Nightmares set power. We had been toying with the same idea internally, and the community request really nudged us over the edge of giving it a go! (NEW) Bottomless Potion of the Unfettered Become immune to control-impairing effects for 5-7 seconds after drinking this potion Akkhan's Leniency Each enemy hit by your Blessed Shield increases damage of your Blessed Shield by 15-20% 75-100% for 3 seconds Bloodtide Blade Death Nova deals 80-100% 300-400% increased damage for every enemy within 25 yards Chantodo's Will Every second while in Archon form you expel a Wave of Destruction, dealing 1000% 4000% weapon damage to enemies within 30 yards. Every time you hit with an attack while not in Archon form, 1000% 4000% weapon damage is added to the Wave of Destruction, stacking up to 20 times Wave of Destruction ticks now scale with attack speed The Dagger of Darts Your Poison Darts and your Fetishes’ Poison Darts now pierce and deal an additional [400-500%] damage. Iron Rose Attacking with Siphon Blood has a 40-50% 100% chance to cast a free Blood Nova Jekangbord Blessed Shield ricochets to 6 additional enemies and has its damage increased by 225-300% 300-400% Sage’s Set Now doubles the amount of Death’s Breaths that drop Previous: Increases Death’s Breath drops by 1 Developer’s Comment: With Patch 2.6.4, we focused on making a lot of changes to different class sets to open up build diversity and level out the comparable power between classes. With 2.6.5, we’re continuing that trend through adjustments to (mostly) Legendary powers we feel have a very strong, fun fantasy, but needed some damage bumps. To participate in the public test, you must have a Diablo III game license attached to a Battle.net account in good standing (i.e. one that hasn't been suspended or banned). In addition, you will also need to download and install the Blizzard Battle.net desktop app if you have not already done so. PTR Character Copy The option to copy your existing Diablo III characters from your live account to the PTR will be available and can be done directly through the PTR client. However, only one region per account can be copied at a time. So, if you choose to copy characters from your account in a different region, any previously copied PTR characters will be lost. As this is a test server, please anticipate uneven game performance, and note that restarts and downtime may occur without warning. Thank you, and we look forward to your feedback. *Header art is of an Enslaved Nightmare from the D3 Wiki. The new patch and season is on the PTR and we're taking a look at all the additions. It's time to complete your weekly Challenge Rift! This week, we've got Uliana Monk with Seven-Sided Strike and Exploding Palm in EU, and Tempest Rush Monk in the US! Mythic Rhythm Beacon of Ytar Harmony Near Death Experience Check out Mnemonic_1's video guide below to master this week's clear! Exalted Soul Chant of Resonance Harmony Momentum Here's Raxx with his weekly video guide! We have a new update for the current 2.6.5 PTR, aka the Season 17 patch, which brings a fair amount of tuning our way. The new Torment difficulties got tweaked so they'd be closer to their respective GR levels, legendaries got both buffs and nerfs and Necromancers' Inarius set got a huge x3(ish) buff, and there's a lot of bug fixes as well so check out everything new in red text below. Also, if you want to find out more about Season 17 itself, you can always head to our hub, with all the info you need. 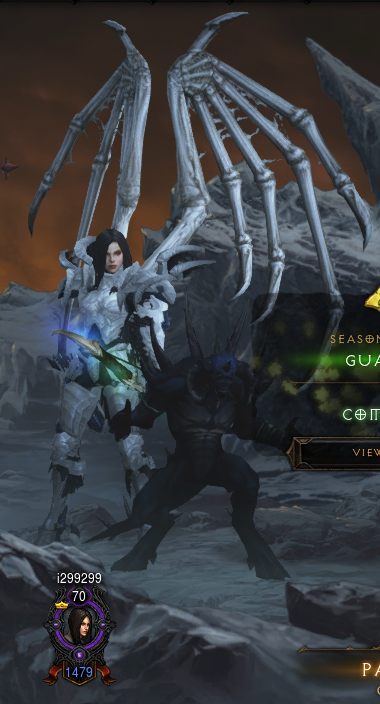 General Quality of Life Seasons Items Bug Fixes Known Issues Note: All changes apply to all versions of Diablo III, including PS4, Xbox One, Switch, and PC unless otherwise indicated. The Season Journey Journal now displays all chapters, regardless of current progression There is a new reward for completing the entirety of the Season Journey (Guardian) For Season 17, the Galactic Wings are available Added the buff for Season 17 Player’s damage dealt is increased by 750% and damage taken is reduced by 4% for every Ancient Item they have equipped while having no Set Bonuses Active Developer’s Comment: The Season of Grandeur was by far our most popular Themed Season yet. In the wake of having a free Ring of Royal Grandeur active, we saw a lot of requests to try the same thing with the Legacy of Nightmares set power. We had been toying with the same idea internally, and the community request really nudged us over the edge of giving it a go! (NEW) Bottomless Potion of the Unfettered Become immune to control-impairing effects for 5-7 seconds after drinking this potion Akkhan's Leniency Each enemy hit by your Blessed Shield increases damage of your Blessed Shield by 15-20% 75-100% 30-35%for 3 seconds Bloodtide Blade Death Nova deals 80-100% 300-400% increased damage for every enemy within 25 yards Carnevil The 5 10 Fetishes closest to you will shoot a powerful Poison Dart every time you do Chantodo's Will Every second while in Archon form you expel a Wave of Destruction, dealing 1000% 4000% weapon damage to enemies within 30 yards. Every time you hit with an attack while not in Archon form, 1000% 4000% weapon damage is added to the Wave of Destruction, stacking up to 20 times Wave of Destruction ticks now scale with Attack Speed Wave of Destruction damage now scales with Attack Speed The Dagger of Darts Your Poison Darts and your Fetishes’ Poison Darts now pierce and deal an additional [400-500%] damage. Grace of Inarius 6-Piece Bonus Bone Armor also activates a swirling tornado of bone, damaging nearby enemies for 1000% weapon damage and increasing the damage they take from the Necromancer by 3750% 10000% Iron Rose Attacking with Siphon Blood has a 40-50% 100% chance to cast a free Blood Nova Jekangbord Blessed Shield ricochets to 6 additional enemies and has its damage increased by 225-300% 300-400% Sage’s Set Now doubles the amount of Death’s Breaths that drop Previous: Increases Death's Breath drops by 1 Sin Seekers Now also adds 250-300% damage to Rapid Fire Wojahnni Assaulter Rapid Fire deals 60-75% 75-100% increased damage for every half second that you channel. Stacks up to 4 30 times. The stacks gained from Wojahnni Assaulter now also stack much more quickly Developer’s Comment: With Patch 2.6.4, we focused on making a lot of changes to different class sets to open up build diversity and level out the comparable power between classes. With 2.6.5, we’re continuing that trend through adjustments to (mostly) Legendary powers we feel have a very strong, fun fantasy, but needed some damage bumps. Step 2: Navigate to the Diablo III tab on the left-hand menu. Step 4: Click Install to begin the installation process. Your PTR account will be created automatically if you do not already have one. The PTR is available in all supported languages, and accounts from all regions are eligible to participate. For additional assistance with installing and launching the PTR, click here.